Phoenix, Ariz. – March 25, 2019: ABI Multifamily — the Western US’ leading multifamily brokerage and advisory services firm — has announced the $27,450,000 / $150,000 Per Unit / $179.90 Per SF sale of Serafina at South Mountain in Phoenix, Ariz.
Serafina at South Mountain Apartments is a 183-unit garden-style apartment community located south of 51st Street and Elliot Road, situated just off the popular I-10 freeway. This affluent and exclusive Ahwatukee area is home to a variety of recreation, resort and retail opportunities, including The Phoenix South Mountain Park/Preserve. Built in 1985, Serafina at South Mountain offers an attractive mix of one- and two-bedroom configurations with mature landscaping, resort-inspired amenities and an impressive South Mountain view. “Serafina at South Mountain offers an outstanding combination of positive features. 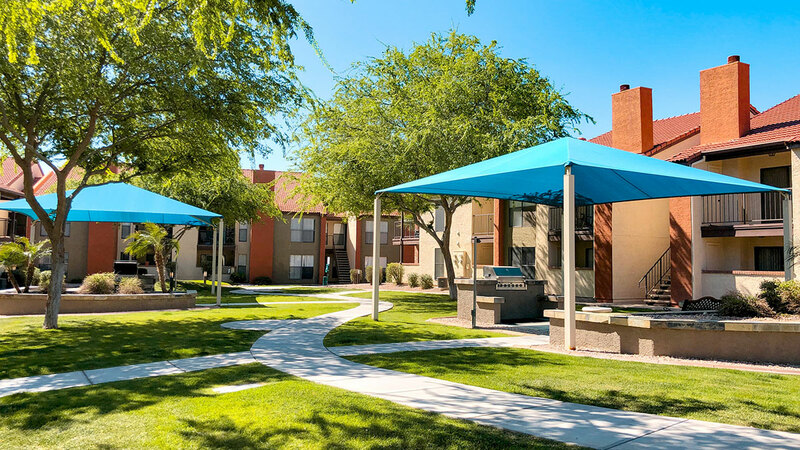 The acquisition expands Western Wealth Capital’s footprint within the exclusive mountain enclave of Ahwatukee,” said ABI Multifamily Partner Eddie Chang, one of the lead brokers for the team representing the Buyer. “The high-income area, established property, desirable unit mix and potential for renovation all combined to create an excellent value proposition for the Buyer. The Buyer, Western Wealth Capital, is a Canada-based private partnership. The Seller is a private investor partnership based in California. The Buyer was represented by the multifamily brokerage team of Eddie Chang, Doug Lazovick, Alon Shnitzer, John Kobierowski and Rue Bax. ABI Multifamily (http://www.abimultifamily.com/) is a brokerage and advisory services firm that focuses exclusively on apartment investment transactions. With offices in Phoenix, Tucson, Sacramento and San Diego, the experienced advisors at ABI Multifamily have completed billions of dollars in sales and thousands of individual multifamily transactions. ABI Multifamily incorporates a global approach with regional real estate expertise to successfully complete any multifamily transaction, regardless of size and complexity.